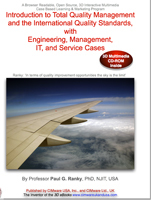 This publication, tested on many undergraduate and graduate students and professionals in the USA and in the UK, is an excellent introduction to Total Quality Management. It discusses the basic methods, tools, technologies, and international standards, with several industrial and research case studies demonstrated by academic and industry experts in 3D. 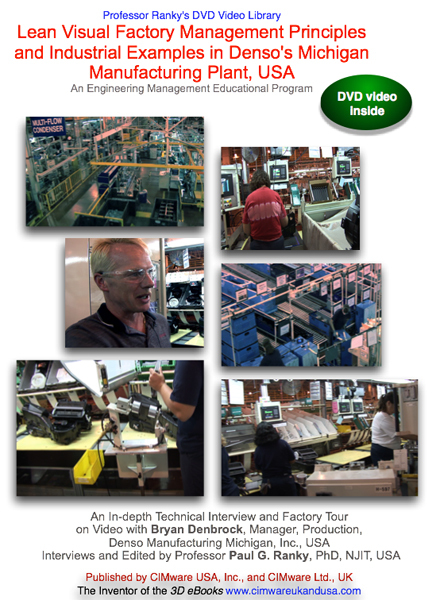 The over 500 interactive screens include text, over 40 digital videos, several hundred images, and highly interactive 3DVR objects, covering: Introduction to Total Quality Management; Overview of ISO 9001:2008 and USA Quality Standards; Deming and Baldrige Awards; Total Quality Control; TQM Process Modeling; TQM and Design Engineering; Collaborative, Networked TQM; Customer Requirements Analysis; Process Risk Analysis; Graphical Methods; Control Charts and Process Improvement Methods; Kaizen, Kanban, JIT, Lean Six-Sigma, and Supply Chain Methods; Networked Six-Sigma; Network Simulation; Software Quality; TQM in Service Industries; Quality Teamwork; Globalization; Continuous Improvement Opportunities and Solutions; Review Questions & Problems; References & Further Reading; Case Documentation Guidelines; Useful Spreadsheet Templates for Educators and Students; A Major Glossary of TQM Terms; Customizable, Open-source MS-Excel Tools & Templates to Perform Your Own Calculations. Description: This electronic publication is a professional quality DVD video of an in-depth, technical interview with Jose Paris, Exterior Designer, Industrial Designer, Ford Motor Company, USA, focusing on the industrial design, exterior and interior design, the integrated product / process / manufacturing / quality and safety design aspects of an exciting new concept car. Description: This electronic publication is a series of professional quality DVD video interviews with representatives of Northrop Grumman Corporation, Information Technology and Defense Enterprise Solutions, USA, Logis-Tech, Inc., USA, HK Systems, USA, and EasySoft Corporation, focusing on RFID principles, methods, tools and applications in manufacturing, assembly, retail, warehousing and storage, distribution and logistics, and others. Description: This electronic publication is a professional quality DVD video interview and a technical discussion with John Crawford, Director of Public Relations - The Americas, Bentley Motors, Inc., Auburn Hills, Michigan, USA. Interviews and Edited by Professor Paul G. Ranky, PhD, NJIT, USA. The discussion topics include an introduction and demonstration of New Product & Process Innovation (NPPI) methods and solutions in the area of modern, high quality, luxurious automobile design. Description: This electronic publication is a professional quality DVD video interview and presentation by Miklos F. Ranky, BS(Eng. Hons), MS(Eng), Professional Engineer, Mercedes Automobile Design, Manufacturing and Repair Expert, Budapest, Hungary, Europe. The discussion topics include case-by-case, in-depth evaluation of several different crashed Mercedes cars, focusing on design for safety and quality, maintenance and repair aspects, as well as on quality design and manufacturing principles and processes. Description: This electronic publication is a professional quality DVD video interview and presentation by George W. Davie, Adjunct Professor at NJIT, New Jersey Institute of Technology, Newark, NJ, as well as Member of the Metropolitan Transportation Authority, Internal Auditor of Bridges and Tunnels, Broadway, New York, NY, USA. The discussion topics include a systematic, in-depth evaluation of the bridge inspection and auditing process, focusing on bridge design for safety and quality, maintenance and repair aspects, as well as on quality design and manufacturing principles and processes. 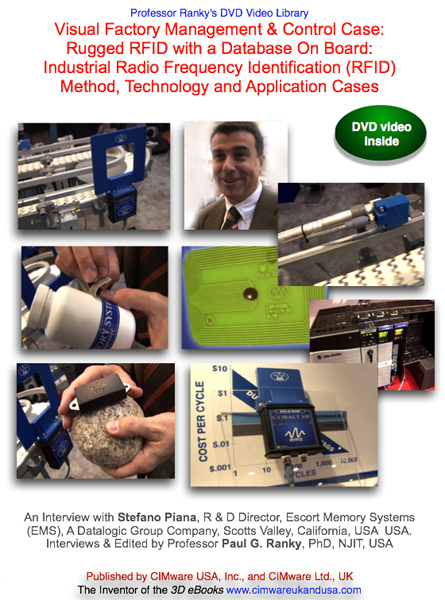 Description: This electronic publication is a professional quality DVD video interview and in-depth technical discussion with Mike Ambro, FARO Applications Engineer, and Robert Prilepok, FARO Account Manager, Detroit Region, FARO Technologies, Inc., Wixom, Michigan, USA. The discussion topics include case-by-case, in-depth demonstration of the FARO portable arm in action. Furthermore we discuss quality control and inspection challenges and solutions with the FARO Portable Arm, integrating temperature compensated joints with contact and non-contact, laser scanner inspection methods and technologies. The optional special Video & Picture Duo Pack includes a DVD video and a CD-ROM with 124 Hi-Res images in standard hi-def .jpg format of Ford Rouge and The Henry Ford! You can play it in your computer as a slideshow. Great for educators, professionals, as well as for entertainment. The optional Video & Picture Duo Pack includes a DVD video and a CD-ROM with 138 Hi-Res images in standard hi-def .jpg format of Ford Rouge and The Henry Ford! You can play it in your computer as a slideshow. Great for educators, professionals, as well as for entertainment. Description: This electronic publication is a professional quality DVD video tour of the BMW MINI plant in Oxford, England, focusing on the bodyshop, including WinGs (working in groups), the New Oxford Way method, robotic welding, robot collision avoidance, robot programming, splatter reduction, body assembly, weld quality assurance, lean design, manufacturing and assembly, and other methods, tools and technologies, not missing out all those excellent people who work in this factory. Description: This electronic publication is a professional quality DVD video factory tour of the BMW MINI plant in Oxford, England, focusing on engine marriage assembly and teamwork, including robotized and manual engine marriage and lean assembly processes, manual and automated assembly processes, smart sensory-feedback tools, robots, and other methods, tools and technologies, team management, team leadership, continuous quality control and training, not missing out all those excellent people who work in this factory. Description: This electronic publication is a professional quality DVD video factory tour of the BMW MINI plant in Oxford, England, focusing on final assembly, including manual and lean automated assembly processes, smart sensory-feedback tools, robots, windshield assembly, final inspection, and other methods, tools and technologies, not missing out all those excellent people who work in this factory. Description: This electronic publication is a professional quality DVD video tour of the BMW MINI plant in Oxford, England, focusing on quality assurance & control, including manual and automated quality assurance and control processes, smart sensory-feedback tools, CMMs (Co-ordinate Measuring Machines), sensory inspection, robots, and other methods, tools and technologies, not missing out all those excellent people who work in this factory. Author(s) / Editor: By Professor Paul G. Ranky, PhD, NJIT, USA. This publication is dedicated with thanks to the following (in alphabetic order) Harry Briggs, Communications Manager, BMW (UK) Manufacturing Ltd., MINI, Oxford, UK, Robin Charlton, Manager, BMW (UK) Manufacturing Ltd., MINI, Oxford, UK, Andrew Cutler, MINI Press and Marketing Manager, BMW, USA, and Frank Ludwig, Technology Manager, Framing, BMW (UK) Manufacturing Ltd., MINI, Oxford, UK, and others. Description: This electronic publication is a professional quality DVD video tour of the BMW MINI plant in Oxford, England, focusing on lean manufacturing and assembly, including robotic framing, welding and lean assembly. Furthermore, during the virtual factory video tour, we cover novel design and assembly methods, tools and technologies, not missing out all those excellent people who make this all happen. Description: This electronic publication is a professional quality DVD video presentation by Paul Silver, Manager, IBM PLM Solutions, and Gary Carne, Technical Support Engineer, IBM, USA, focusing on the key elements, and the benefits of Digital Mocup (DMU) within Dassault Systemes' PLM (Product Lifecycle Management) set of methods and software tools. The presentation includes several advanced digital product review, assembly, process planning and simulation use cases from the automotive industry, nevertheless the principles presented apply to literally any industry. 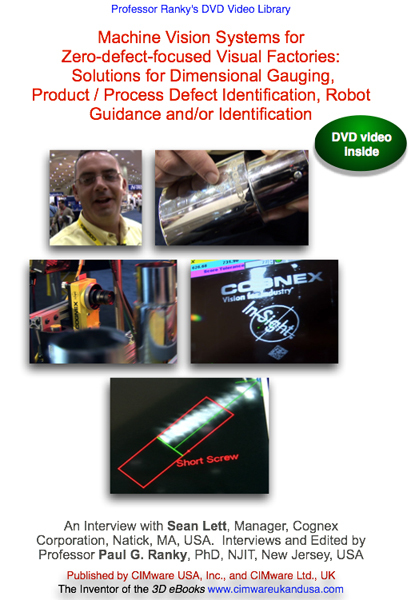 Author(s) / Editor: An Interview with Sean Lett, Manager, Cognex Corporation, Natick, MA, USA. Interviews and Edited by Professor Paul G. Ranky, PhD, NJIT, New Jersey, USA. Description: This publication is a professional quality DVD video covering machine vision systems for zero-defect-focused visual factories. Solutions for dimensional gauging, product / process defect identification, robot guidance and/or identification are discussed and partially demonstrated. Machine vision, the industrial implementation of computer vision, is an essential building block of modern, visual factories. Author(s) / Editor: Edited and produced by Professor Paul G. Ranky, PhD, NJIT, New Jersey, USA. Description: This publication is a professional quality DVD video covering rugged RFID (Radio Frequency Identification) methods and solutions. RFID is a major enabler in terms of tracing products, processes, accounting for inventory changes close to real-time, and integrating supply chains with the purpose of cutting losses and making any enterprise leaner. On its own, RFID is an exciting technology only... the key is to integrate RFID into a transparent, visually controlled business. VFM is an integrated set of methods and technologies for the purpose of reducing waste at all levels, improving profitability, increasing lean production control, product & process quality. 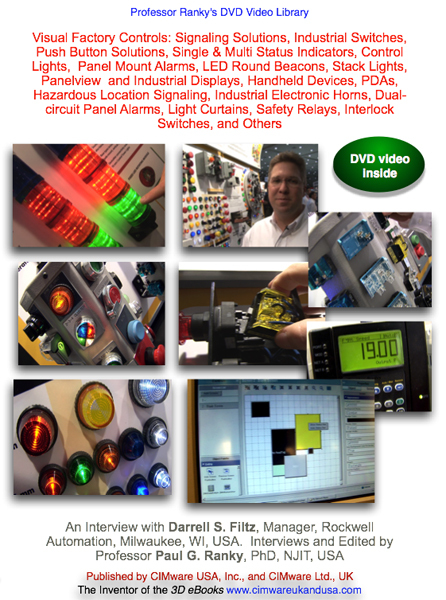 Description: This publication is a professional quality DVD video covering Visual Factory Management & Control (VFM) topics, in particular signaling solutions, industrial switches, push button solutions, single & multi status indicators, control lights, panel mount alarms, LED round beacons, stack lights, panelview and industrial displays, handheld devices, PDAs, hazardous location signaling, industrial electronic horns, dual-circuit panel alarms, light curtains, safety relays, interlock switches, patented, enhanced E-stop safety self monitoring industrial switches & contact blocks, and others. Description: This electronic publication is a professional quality DVD video resource for all of those who wish to analyze and then model everyday-life processes. 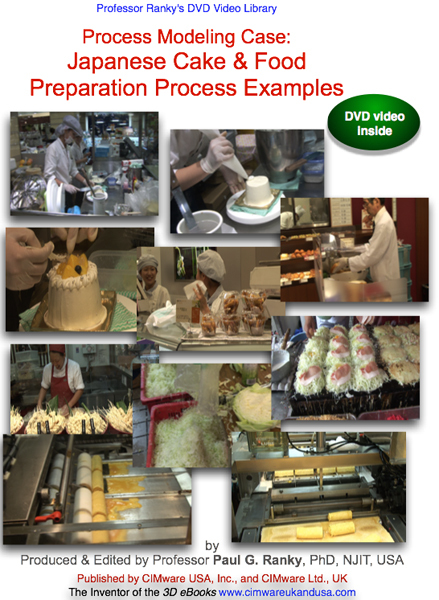 The video takes the viewer to the modern, 21st Century Japan, to Osaka, and illustrates several interesting Japanese cake and food preparation processes. This video could be used for triggering in-depth process analysis as well as quality audit discussions. Furthermore, it is an excellent resource complementing Professor Ranky's videos on Total Quality Management, Continuous Quality Improvement, Customer Requirements Analysis, Risk Analysis, Design Review, and other process modeling methods, tools and practical solutions. Description: This publication is a professional quality DVD video covering Festo factory automation components and systems in a Visual Factory Management & Control (VFM) framework. VFM is an integrated set of methods and technologies for the purpose of reducing waste at all levels, improving profitability, increasing lean production control, product & process quality, productivity, safety, on-demand / just-in-time (JIT) production / delivery, and employee morale in a factory, or virtually in any business. 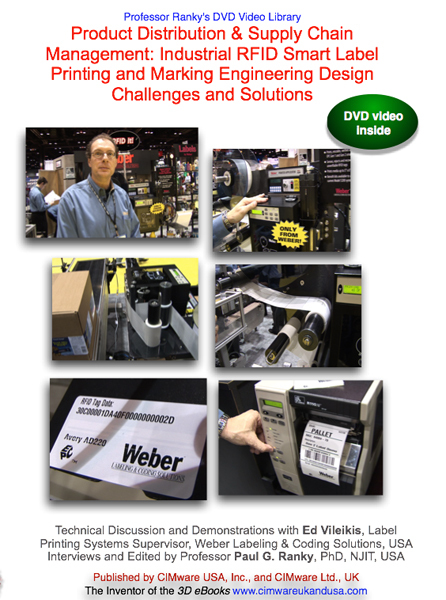 In this DVD video we focus on factory automation components & systems, including ISO & NFPA standard cylinders, guide & slide units, rotary actuators, rodless linear actuators & displacement encoders, pneumatic grippers, precision parallel grippers, grippers for harsh environments, swivel grippers, and others, air filtering, air diagnostics, Rockwell Automation integration solutions with Fieldbus, Ethernet / IP and other technologies, plug-and-play valve manifold I/O for Ethernet / IP enabled controllers, remote device / system monitoring & troubleshooting over the web, Festo CPV valve terminals for DeviceNet, fast switching valves, fluid muscle cylinders, servo valves to control the hard stop, various integrated systems, and other factory automation & control solutions. Description: This publication is a professional quality DVD video introducing and demonstrating various RFID smart labeling and marking methods, features, and machines. The in-depth technical interview and demonstrations also illustrate some RFID related aspects of product distribution & supply chain management, warehouse operations management, quality control and traceability issues, RFID product labeling machines, methods and technologies. Also excellent for undergraduate / graduate education and research. See more about these methods and technologies in Professor Ranky's Library. Welcome to www.cimwareukandusa.com Please note, that this website is kept as simple as possible to support fast data access from anywhere in the world! CIMware Ltd. UK and CIMware USA Inc. are privately owned companies, and IEE & IMechE approved (The Institution of Electronic and Electrical Engineers, London, incorporating The Institution of Manufacturing Engineers, and by The Institution of Mechanical Engineers, London, United Kingdom) Professional Continuing Education Engineering, Medical, Biomedical Engineering Multimedia Developer and Publisher. All rights reserved! The entire CIMware UK&USA web-site is copyrighted by CIMware Ltd. UK and CIMware USA, Inc. 1995 to date. Furthermore please note, that the packaging formats, the contents and the price of our products can change without any prior notice. Thank you for visiting our website, enjoy the tour and email us if you have any comments or suggestions! All known trademarks are acknowledged. CIMware UK&USA Offers: DVD videos, 3D interactive eBooks on CD-ROM, ADAM, The Advanced Design And Manufacturing with IT Journal, New Design, Manufacturing and Information Technology Product Announcements, Cyberspace Product and Service Reviews in our Cyber Expo. Virtual Exhibition Hall, Engineering Case Studies, Work-cell Design, Agile Manufacturing, Lean Manufacturing, Flexible Manufacturing, KANSEI, Flexible Assembly, De-manufacturing, Automation, Robotics, Sensors, Machine Vision Systems, Lasers, FMS, CIM, Concurrent / Simultaneous Engineering, DFM, DFA, DFx Analysis of Existing and New Products and Processes, Total Quality, ISO9000:2000, Engineering Case Studies, Production Control, JIT, Medical Science and Biomedical Engineering, Rehabilitation Engineering, Systems Engineering, System Modeling & Design, Simulation, Virtual Manufacturing, Interactive Engineering Multimedia, Multimedia Design and Resource Generation, Multimedia Production, Electronic Publishing, Website Design, Engineering and Multimedia Consulting, Project Management, and Complex Product Marketing Services using Professional Quality Digital Art and Interactive 2D and 3D Multimedia over the web as well as using other formats, such as CD-ROMs and DVDs. ADAM with IT is an Internet Registered, 100% Electronically Published R&D Journal Listed in the Directory of Scholarly Electronic Journals and Academic Discussion Lists, Published by the Association of Research Libraries, Washington DC, USA and professionally Indexed by The Edinburgh Engineering Virtual Library (EEVL). Copyright© 1995 to date by CIMware Ltd. UK and CIMware USA, Inc. Disclaimer. CIMware Ltd. UK and CIMware USA, Inc. at www.cimwareukandusa.com makes appropriate efforts to ensure that the information on this entire website is accurate. Neither www.cimwareukandusa.com nor its sponsors are responsible for loss due to inaccurate information. Mention of third-party products or services is for the purpose of providing information about them and do not constitute neither an endorsement nor a recommendation. CIMware Ltd. UK and CIMware USA, Inc. at www.cimwareukandusa.com and its sponsors assume no responsibility in regard to the use or performance of these products or services. In case such information is required, CIMware Ltd. UK and CIMware USA, Inc. at www.cimwareukandusa.com suggest contacting such third parties directly for additional information and to confirm information found here at the www.cimwareukandusa.com website. Thank you for your attention! We cover a wide variety of products and services in the area of Product Lifecycle Management PLM, Advanced Design Engineering, Product / Process Design Engineering, Manufacturing, Total Quality Management, Multimedia, 3D web, Medical and Biomedical Engineering, Engineering Multimedia, Case Based Learning, Problem Based Learning, Context Based Learning, Virtual Product Demo, Design for Environment, DFE, Design for assembly, 3D web-objects, Object Oriented Design, Programming, Computers, Concurrent Engineering, Rapid Prototyping, Advanced Design, Manugacturing, Automation, Robotics, Flexible Manufacturing, Asembly, High Tech, Hi-tech, Computer Science, and Information Technology. Our sponsors and/ or collaborators include NJIT, BMW, MINI, Daimler-Chrysler, IBM Dassault Systemes, DELMIA, Department of Defense (USA), EDS, Emerald Publishers, Festo, Ford Motor Company, Genrad, GM (General Motors), Hardinge, IBM, IMI Norgren, Kessler Rehabilitation Institute, MCI, New Jersey Medical and Dental School (UMDNJ), Mercedes Benz, Nissan, Acura, Lexus, Honda, Infiniti, OKUMA, Yamazaki-MAZAK, Rolls-Royce, Bentley, Siemens-Plessey, Kistler, Denso, Rockwell Automation, Springer Scientific Publishers, Taylor & Francis Publishers, Springer Scientific, Fanuc Robotics, General Motors, GM, FLOW, Hexel, LEGO, Kluwer Academic Publishers, Toyota, Oakridge National Laboratory, Sekisui Automotive Japan, Yamazaki Mazak, and many others. This site is listed as a reference source in the directory of the NSF (National Science Foundation, USA) National Center for Manufacturing Education, www.ncmeresource.org.